If his thinking has been sound, then this world is at the end of its tether. The end of everything we call life is close at hand and cannot be evaded. I am reported to be ‘pessimistic’ about broadcasting… The truth is that I have anticipated its complete disappearance – confident that the unfortunate people, who must now subdue themselves to ‘listening-in’, will soon find a better pastime for their leisure. Cynicism is humour in ill-health. He had the face of a saint, but he had rendered this generally acceptable by growing side-whiskers. Arson, after all, is an artificial crime… A large number of houses deserve to be burnt. He found that a fork in his inexperienced hand was an instrument of chase rather than capture. Of course we can Learn even from Novels, Nace Novels that is, but it isn’t the same thing as serious reading. Notice the smug suppressions of his face. In his mouth are Lies in the shape of false teeth. At times I suffer from the strangest sense of detachment from myself and the world about me; I seem to watch it all from the outside, from some where inconceivably remote, out of time, out of space, out of the stress and tragedy of it all. Yet, across the gulf of space, minds that are to our minds as ours are to the beasts that perish, intellects vast and cool and unsympathetic, regarded this earth with envious eyes, and slowly and surely drew their plans against us. Bah! the thing is not a nose at all, but a bit of primordial chaos clapped on to my face. He was a practical electrician but fond of whisky, a heavy, red-haired brute with irregular teeth. He doubted the existence of the Deity but accepted Carnot’s cycle, and he had read Shakespeare and found him weak in chemistry. 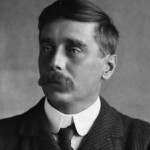 Herbert George Wells, known as H. G. Wells was born in Bromley, Kent, England. He was a English writer in many genres, including the novel, history, politics, social commentary, and rules for war games. He is now best remembered for his science fiction novels and is called a "father of science fiction", along with Jules Verne and Hugo Gernsback. His most notable science fiction novels include The Time Machine, The Island of Doctor Moreau, The Invisible Man, The Sleeper Awakes, The First Men in the Moon, The War in the Air, In the Days of the Comet, and The War of the Worlds. He wrote other novels include: The Wonderful Visit, Love and Mr Lewisham, The Sea Lady, Kipps, A Modern Utopia, Ann Veronica, The History of Mr Polly, The Wheels of Chance, The World Set Free, Men Like Gods, and Tono-Bungay. He earned a BS degree in zoology from the University of London External Programme. In 1889–90 he managed to find a post as a teacher at Henley House School, where he taught A. A. Milne. He was nominated for the Nobel Prize in Literature four times.